In the HBO television series "Game of Thrones" (based on the series of books entitled "A Song of Ice and Fire") the audience is introduced to the Starks, a proud, historic family that lives in the north of Westeros. The family patriarch is Ned Stark, a highly principled man who believes in honor and duty, and is unwilling to compromise those values for pragmatic gains. Even with Wednesday's win, Arsene Wenger must buy. This ethos serves him well for most of his life, until he is thrust into a brand new situation in a different world, a world that renders his honor moot and laughs at the principles that he holds so dear. Despite standing tall in the face of these dark forces, he eventually is laid low, a victim of the very philosophy that made him one of the most respected men in all the land. Arsene Wenger has been in the "Ned Stark in King's Landing" phase of his career for several years now and like Ned, he seems to be fighting a losing battle. 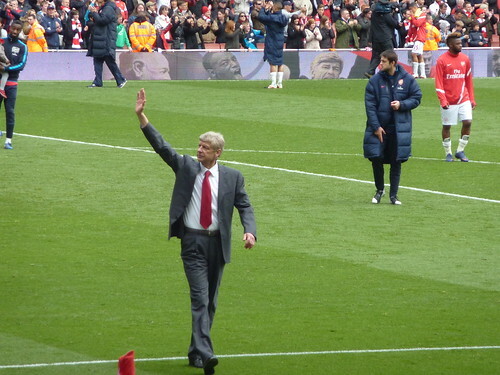 Wenger is one of the most respected managers in the history of Arsenal and of the modern English Premier League. Upon arriving at Arsenal in 1996 he transformed the Gunners into a new breed of squad, doing everything from introducing dietary guidelines to bringing in foreign talent if he felt it benefited the team. With Arsenal he won four FA Cups and three league titles, including 2003-2004 when "The Invincibles" became the first in 115 years to go undefeated over the course of a season. He is a legend both at the club and in the league, and he was the perfect manager to guide Arsenal into the current era of football. The problem is that like Ned Stark, he hasn't adjusted to the changes that have been made since. Wenger has long been known for his strict valuations of players. His strategy is talent assessment combined with an economic approach that often sees his team developing cheaply priced talent and only selling at significant profits to the club. He never spends more money than he deems a player is worth and that is why he was so integral to the construction of Emirates Stadium and the debt repayment plan. Now, however, the team has money that they can spend (at least according to numerous public statements by members of the board) and yet Wenger remains stuck in what has worked for him in the past. The problem is, the world has changed; it has become much more expensive. The massive influx of money into the Premier League has brought us into a whole new world where there are some teams that can simply buy anyone. If everyone is on roughly the same playing field then money spent on one player cannot be spent on another and teams must be very choosy about who they pursue. But if the money is coming from a magical wallet where there's always a bill no matter how many you take out, the idea of spending smartly goes out the window and this changes the market for all the other teams as well. The market still determines the price of players, but now prices are higher than ever and what once was possible simply is not any longer. Falcao, the hottest commodity on the market this past transfer window, signed with AS Monaco FC who had just been promoted from Ligue 2 due to a flood of Russian billionaire money. If one were to ask Falcao why he didn't sign with a powerful team with a rich history, he would most likely say something about believing in Monaco's project when it reality it has a lot more to do with the truckloads of money that were backed up to his front door. Clubs with these bottomless vaults are only competing with each other while the rest of us are trying to eat off the scraps. Wenger has taken on this Stark quality of naivete and stubbornness because he doesn't believe that it is acceptable for clubs to perform as the Manchester Cities and Chelseas and Monacos have done. That is a very valid and reasonable statement; however it doesn't change the way that things are in the world. Cersei and Varys aren't going to stop being devious because Ned doesn't like it and Paris Saint-Germain isn't going to stop throwing ridiculous fees and wages at available players because Wenger thinks it's bad business. These clubs exist and Arsenal's management has to discover how to operate in this kind of world. The reason why we are unfortunately reaching a time when we must assess Wenger's ability to deal with the current market is because he has shown no ability (or perhaps willingness) to adapt. It is not enough to bid for Gonzolo Higuain and then complain about ridiculous prices when he cannot land him. If Arsenal is going to stick to "reasonable" valuations and then refuse to go above them when the price skyrockets (this shouldn't be the case, but if it is), they must turn their attention away from the Higuains and Luis Suarezs of the world. There is no sense in wasting time and effort trying to woo those players if the conviction doesn't exist to take what they're chasing. Instead, focus on mid-level players (in terms of expense) and use the scouting system to determine which players are due to break out. Luis Gustavo certainly seemed like he would have been an example of that and Progba of Juventus is another that might fit the bill. If Arsenal won't spend top tier money then they need to adjust their strategy so that they are still bringing in realistic targets and improving the team. Maybe Wenger can't play with the oil rich clubs but he can certainly find the new market efficiences that will allow the team to succeed. The reality of the situation is that this is the type of market Arsene must deal with. If he refuses to, or if he tries to hold to his morals unsuccessfully, it sadly is time for him to go. Ned Stark ended up on the chopping block and while there are few that want Arsene to get to that point, the club, like the realm, is bigger than one man. A khal who cannot buy is no khal.